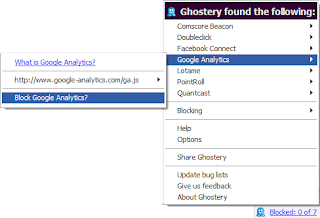 Ghostery is a web browser add-on that helps users to protect internet privacy, block tracks from many web services, most are ad-networks, behavioral data providers, web publishers, and other companies interested in your online activity. If you don't like somebody watches you in the corner, you should take a try with this add-on. 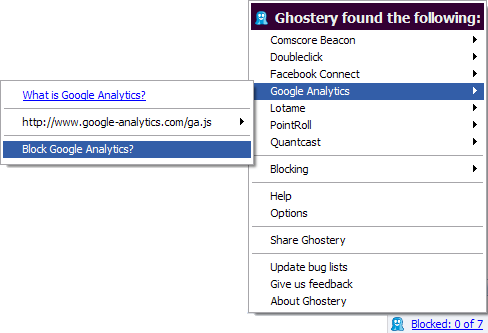 Ghostery supports major browsers, like IE, Firefox, Safari, Google Chrome, Opera, even iPhone, iPad. After you downloaded and installed, just restart browser, follow Configuration Wizard. Most steps are click "Next", only with this page, you can choose what you want to block. Every time you are surfing on any website, it will display which tracker blocked, click it you can find more information.